There is not enough child care in Petersburg. One of the preschools, the Petersburg Children’s Center, has a waiting list of 45 kids. A planned expansion could help drop that number. It’s mid-morning and a handful of toddlers are stomping and growling around a colorful room. These kids are in the toddler room at the Petersburg Children’s Center. The center cares for 45 children ages six weeks to prekindergarten. 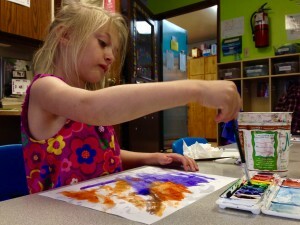 The center also runs an after school program for kids kindergarten through sixth grade called Eagle’s Nest. There are 24 children in that program with a waiting list as well. The toddlers find their places and settle into story time. Through the door is Brandi Heppe’s office. She is the Director of the children’s center. She says she takes calls all the time from parents needing childcare. The waiting list has increased in the last few years especially with the 3 to 4 year olds. The center just can’t take more children without a larger space and additional workers. It is a state-licensed private non-profit and follows State of Alaska guidelines which set class sizes. The center employs 11 full time workers and four part-time. Heppe says smaller class sizes work better anyway. “We just want to make sure that children are being taken care of and valued and just the quality of child care that we want to come out of here just to go on for years and years because I remember coming here as a child and the quality of the care is the exact same as it is now,” she said. Across town, Glorianne Wollen is in the Petersburg Harbor Office answering a constant stream of calls. She’s the borough’s harbor master and summer is her busy time. She’s also a well-known volunteer in town and helping the Children’s Center is her new focus. She says she learned about the center’s long waiting list during a borough assembly meeting. She heard that the center wanted to build an addition in order to take more kids so she decided to donate her own money to the project. Then she checked in with the borough’s Economic Development Council to see if it was an economic issue. The answer was yes and the council’s board donated $10,000 to the cause. A few more people have come on board and Wollen hopes the momentum continues. “This is a project that maybe we could help ourselves with rather than going to the state and waiting for them to give us money and know-how to do this,” she said. The seed money has grown to $22,000. With that, the center is going ahead with the project with the hopes that more funds will come forward. Construction is set to start this fall. The plan includes adding two classrooms to the west side of the building. The labor would be all volunteer happening on nights and weekends. Local businesses have agreed to help get supplies at cost. The project’s estimated price tag is less than $100,000. Wollen says it will be money well spent. The expansion will allow 12 more kids into the center. “Now they just have wonderful programs and these little kids are learning things and sparking interests at young ages and I’m just so impressed with what they’re doing up there,” she said. The expansion project comes just as the Petersburg Children’s Center celebrates its 40th anniversary this year. Wells Fargo bank in Petersburg has set up an account for the Children Center’s expansion project. You can also contact Glo Wollen or the Children’s Center for more information.